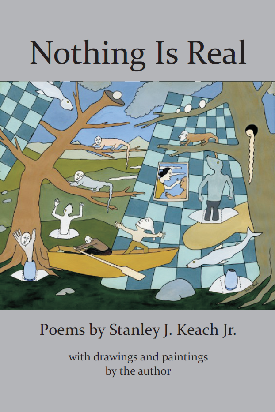 Keach's poems' [show a] mind-boggling range of utterance and..reckless delight in life's mystery, misery, folly, dread and gnomic intractability...along with...freedom and uncanny skill. Keach sings the language of Albert Camus: "every blasphemy is, ultimately, a participation in holiness." The sanctity of Keach's NOTHING IS REAL resonates in the giddy image of "Mother Will Ride On A Hog", the book's illustrated last poem. And yammerings. She asked what did me in. Our sad petite affair continued thus. Don�t match up any better, do they, friend? Just decomposing, into hair and bone.